A fixed camera companion to FOG LINE. 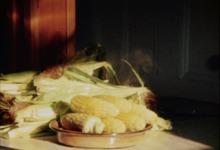 Bright green leaves stripped from ears of corn, and later, the vibrant yellow ears placed steaming in the waiting bowl. Each of these actions inaugurates a period in which one contemplates an image whose steady transformation is barely perceptible–the delicate slow movement of light and shadow, the evolution of subtle steam into the film grain. 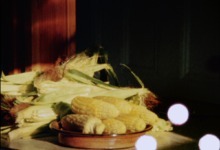 A meditation on the fragile moments of corn's passage from living sun-nourished plant to food to light image. The mind attempts to grasp duration itself, to distinguish its own creating from its perceiving, but distictions blur in the wholeness of times's and consciousness' flow. –L.G.